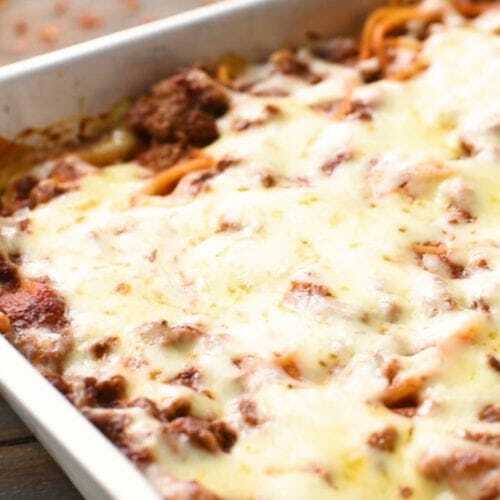 This classic baked spaghetti casserole is taken over the top by adding a layer of Alfredo sauce in the noodles at the base. We also refer to this as Spasagna at our house! 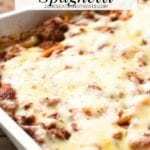 This spaghetti recipe is a delicious, comforting casserole that starts with a base of Alfredo noodles then is layered with a hamburger sauce and cheese. It makes a lot and is perfect to freeze half and enjoy as a freezer meal or feed a large crowd. Toss a salad together, throw some garlic bread in the oven and you have dinner! I ran to the grocery store after work to get a pound of hamburger for this recipe. I’m chilling out in the meat department minding my own business standing next to a gentleman and staring at the shelf. All of a sudden there is someone on the other side of me. I mean RIGHT on the other side of me. I’m standing there thinking wow she’s really in my bubble, do I dare take a glance to see who this crazy person is or are they going to totally know I’m slightly annoyed? Well, I took the chance. I’m turning my head and I see this girl grinning from ear to ear. Oh I should have known I live in small town USA, of course, it’s someone I know! It was actually a really close friend and we had a good laugh over it. Then she told me she was going to follow me around the grocery store and see what I was making tonight. I giggled. I toyed with the idea of Crock Pot Spaghetti or Meatball Sub Casserole but then thought hmmm…. But then my buddy started chatting. She went on to tell me that her husband asks nightly what Julie is making. She’s one of my biggest readers and I love hearing feedback from her and all the rest of you. As I didn’t want to leave her hanging until tomorrow to read up on my blog about my recipe and I just happened to have it in my purse, I whipped it out and shared it with her. I told her that if you see it on the blog tomorrow it’s a success but if you don’t it was a flop! Since I’m posting it you obviously have figured out it was a success! It blends the best of both worlds incorporating Alfredo sauce and tomato sauce in the same dish. It was great and we decided it was a “keeper”. My husband then asked where all the keepers actually went because he rarely gets the same recipe twice. I’m a bit adventurous like that. I giggled and pointed to my overflowing recipe box. He just rolled his eyes at me. True love, I tell ya. 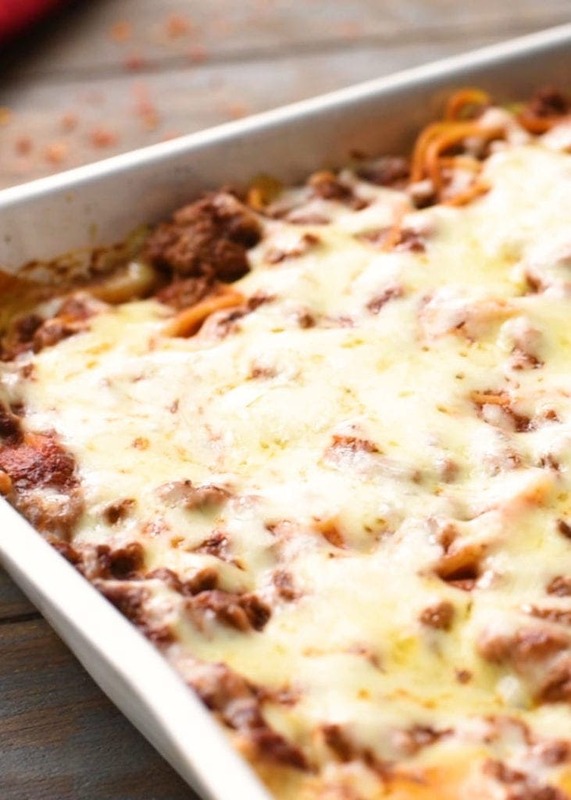 Another one of our favorites in that recipe box is this amazing mostaccioli! 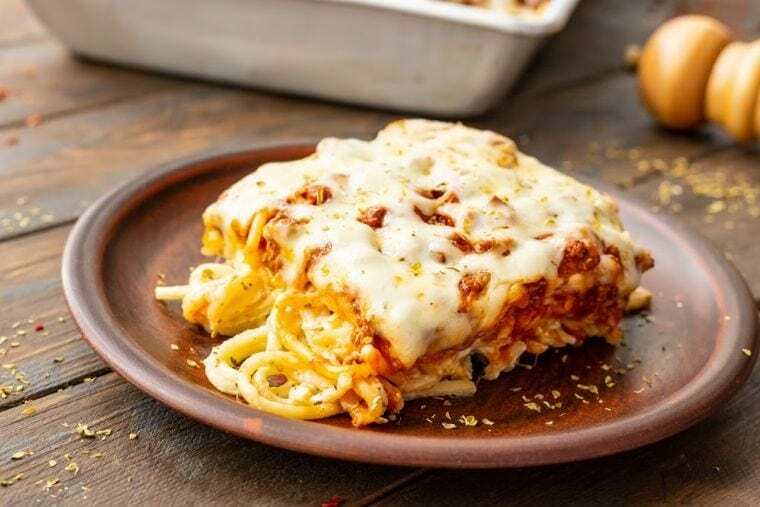 We also refer to this casserole as Spasagna but since I figured most of you would raise your eyes at that we just went for the name Baked Spaghetti instead. Now, if you want to be cool like the rest of us then called it Spasagna! Coat the baking dish with nonstick spray. Cook spaghetti noodles according to package directions. Rinse noodles under cold water and drain well. In a large bowl, combine Alfredo sauce, 2 c. mozzarella, milk and spices. Stir well to combine. Add the cooked spaghetti noodles and toss to coat them completely. Place into the baking dish. Brown beef and drain well. Add spaghetti sauce and mix. Pour mixture over the noodle mixture in the pan. Cover with and bake until hot and bubbly. Here are some great salad options! Traditional Seven Layer Salad • Greek Salad • Strawberry Romaine Salad any of these salads would be perfect and this bread will round out the meal! Rosemary Bread (Macaroni Grill Copycat) is a real favorite and soooo good! More great casserole recipes to try! Winter is the perfect time to enjoy this hearty casserole! When you make it be sure and tag me on Instagram @julieseatsandtreats or #julieseatsandtreats. And if you have a quick moment, please comment and leave a five-star rating below! Try it and love it? Rate it, please!!! 😋Seriously though a five-star rating below will make my day! If you snap a photo, please be sure tag me on Instagram at @julieseatsandtreats or #julieseatsandtreats so I can see your yummy meal!!! This classic baked spaghetti casserole is taken over the top by adding a layer of Alfredo sauce in the noodles at the base. starts with a base of Alfredo noodles then is layered with a hamburger sauce and cheese. Cook spaghetti noodles according to package directions. Rinse cooked noodles under cold water and drain very well. In a large bowl, combine Alfredo sauce, 2 c. mozzarella, milk, oregano and parsley. Stir well to combine. Add cooked spaghetti noodles and toss to coat them completely. Place entire mixture into the baking dish. Brown beef, drain well to remove excess grease. Over low heat, add spaghetti sauce and mix. Pour mixture over the noodle mixture in the pan. Top with remaining cheese. Cover with aluminum foil and bake for about 30 minutes. Hi there Julie! It’s so funny, because I am pretty much the same way about ‘keepers.’ I will ask my family if they like it enough to have it again, and then who knows if that ever happens! LOL! I have 100’s of cookbooks, and I love to browse through them. Not to mention, I read 50+ food blogs every day! LOL! There is never enough time to make everything I want. This recipe sounds yummy! I like your ‘blog hop’. I am new to blogging and haven’t figured out all the intricacies of the interface, etc. Just added this to my weekly menu for next week! I’m excited, it look so good!! 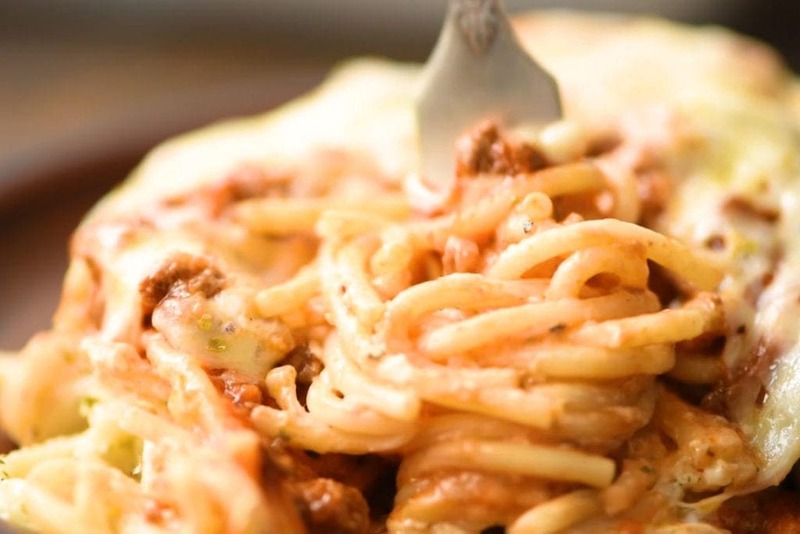 this is saved in my google reader – I was going to bake the meat sauce with the alfredo spaghetti. Glad to hear you would do the same thing. I can’t wait to try this. There should be a recipe card with a printable option for the recipe showing all of that information. If you can not see that please let me know. Good luck with your WW journey! Oh this is all the comfort! Thank you for sharing! It truly is! So delicious! 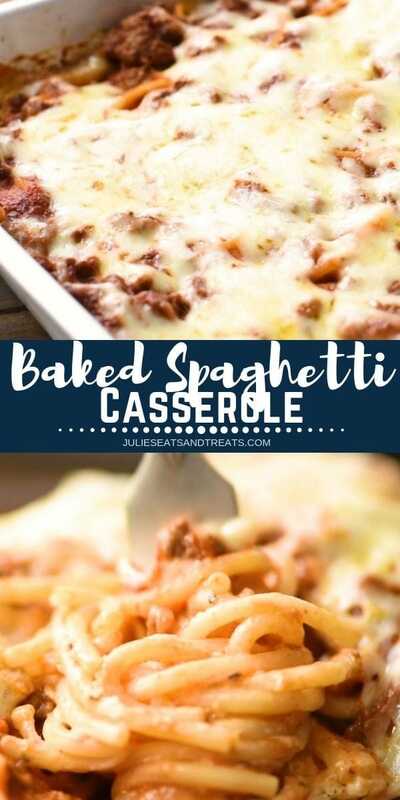 I love love LOVE baked spaghetti! 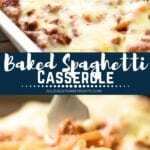 I love that this one uses alfredo AND spaghetti sauce….it was sooooo creamy and good, my kids gobbled it up! What kind of alfredo sauce do you use? I haven’t seen garlic alfredo sauce around here. I use the Bertolli Garlic Alfredo Pasta Sauce!